Frameless shower doors are hot right now because they show off cool tile designs in the shower and visually open up the room, keeping it light and airy. They also look beautiful, elegant, and serene. These showers are wonderful for people who are creating age-in-place homes. The curbless design works for those with wheelchairs or limited accessibility. Curbless showers are also replacing the tub/shower combination for people who are looking to lose the bathtub. You’ve probably been looking at tile, fixtures, and grout colors, but think about the utility of a bench for shaving or just sitting down to relax under the water for a minute. They can vary from simple waterproofed furniture to ledges to elaborate built-in features. You’ll be glad you thought of this! This is a fancy, permanent, visually appealing place to put your shampoo, conditioner, and body wash. Niches can include LED lights, glass or stone shelves, and accent tile work. These are very popular as an option to an existing drop-in tub. 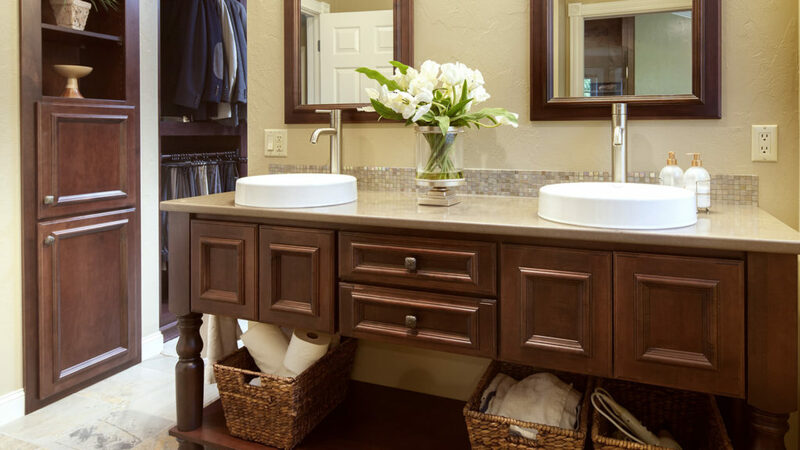 Use one with rounded lines to accent other hard lines in the bathroom, or an angular one to contrast softer colors. This is a big trend because you can customize the size, material, drawer and cabinet configuration, finish, and sink options. We are a custom cabinet dealer, so we have the ability to make custom modifications for your space and your needs. No one has ever asked us for a smaller shower. Enough said. I’ll talk more about this in another post. Colored grout on white subway tile makes it pop, which is very popular right now. This forces your eyes to see both the tile and the grout, which is great to create a checkerboard effect or a classic black-and-white pattern. If you’re worried about falling out of love with the effect, grout can be stained to change its color.